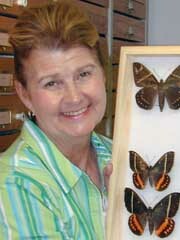 Jacqueline Miller studies butterflies and moths. She has caught them in Cuba, bagged them in the Bahamas and netted them in the Netherlands Antilles. She has analyzed the way they disperse in addition to other behaviors and how they have changed over time in comparison to their fossilized ancestors. As a curator and associate director at UF’s McGuire Center for Lepidoptera and Biodiversity, her passion for these appealing insects has earned the respect of her peers worldwide. One of Miller’s main areas of interest is the Castniidae, a small family of moths that bear unique similarities to butterflies. So striking are the similarities between these brightly colored moths and sometimes economic pests and their associated butterfly relatives that Miller’s work has resulted in a complete revision of the taxonomy of the Castniidae. She has investigated these moths from Mexico through Argentina and Chile. In 2007, she described a new genus of Castniidae, called Insigniocastnia, and other new descriptions are in progress. Most of Miller’s research is focused throughout the neotropics, which includes the Caribbean, Central America and South America. She has completed biodiversity surveys throughout the West Indies and co-authored the book Butterflies of the West Indies and South Florida. She has also worked extensively on the diversity of butterflies in Aruba, Bonaire and Curacao in the southern Caribbean, also known as the ABC islands. Her interest in lepidopteran fauna of these islands resulted in a popular field guide that was printed in both English and Papiamentu, the native language of the islands. In addition, Miller has conducted extensive field work throughout Mexico. In 2001, she initiated a project with four Mexican universities to study the biodiversity of butterflies and moths in Mexico and to develop a collaborative biological database. Miller also co-authored The Butterfly Handbook, which describes more than 500 international butterfly species.